The modern kitchen is the hub of the home, and as such it serves multiple purposes. In addition to food storage, preparation, cooking, and eating, the kitchen also tends to be the center of home entertaining, family time, study time, and more. This is precisely why kitchen design today frequently includes not only an oven, refrigerator, and cabinets, but also a customized island with space for entertaining, a beverage bar, or even a pet feeding station. Every household has unique requirements, which can depend on many factors such as the number of people in the house, the age profile of household members, how frequently you cook and entertain, and much more. There are a number of ways you can customize your kitchen renovation to enhance the style of your kitchen, while also making your day-to-day life easier and more enjoyable. For example, kitchen cabinets can be selected in any shape, size, height, or wood finish to meet your individual requirements, but they also hide a treasure trove of personalized storage space that can be fitted with specialized accessories to be sure you have a place for every item in your kitchen. Likewise a kitchen island can be specially designed to your requirements, whether you plan to help your kids with their homework, prepare food, bake, or sit and enjoy a glass of wine with friends. A personalized kitchen design that can actually make your life easier may sound like a dream, but there are a number of innovative solutions available that can make that dream a reality. 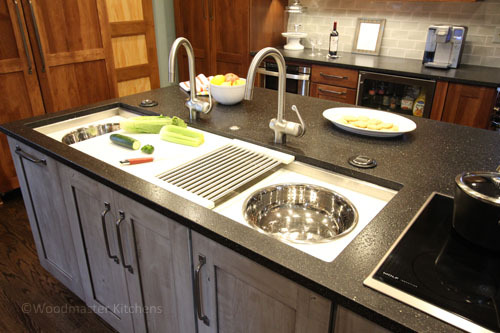 When it comes to customizing your kitchen, The Galley Sink is a unique solution to all of your food-related requirements! This individualized workstation allows you to fully customize your sink area and turn it into a single location where you can easily wash, chop, strain, serve, entertain, clean up, and more. Best of all, it comes in a variety of sizes so it can be incorporated into almost any size kitchen. Incorporate sliding cutting boards on both the upper and lower tiers to allow one or more people to chop and prepare food, as pictured to the right. Include platforms with cutouts where you can interchange colanders or stainless steel bowls for rinsing and preparing food, as shown below. For entertaining, a platform with a bowl insert can be filled with ice and used to keep food or beverages cold, and the cutting boards make a convenient and attractive place to arrange food for guests. Add a draining rack to help to simplify the clean-up, as pictured in this example below. The Galley Sink, along with other personalized features, will elevate your design to a new level and make your time spent in the kitchen easier and more enjoyable. See more great ideas in our kitchen design gallery or contact us for more information. If you would like to learn more about the innovative Galley Sink, check our website for details on our upcoming exclusive showroom event in February.